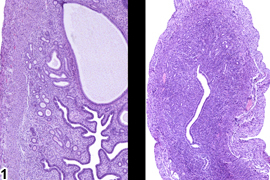 Uterus - Atrophy in a female B6C3F1/N mouse from a subchronic study (right image; left image is control). The uterus of the treated animal (right) is atrophic compared with that of a control animal (left). Image provided courtesy of Dr. R. Miller. Atrophy is a common age-related change and can also be induced by agents that cause ovarian damage or alter steroid production from the ovary. Atrophy can affect the endometrium and/or myometrium and results in a reduction in the overall size or cross sectional area of the uterus. 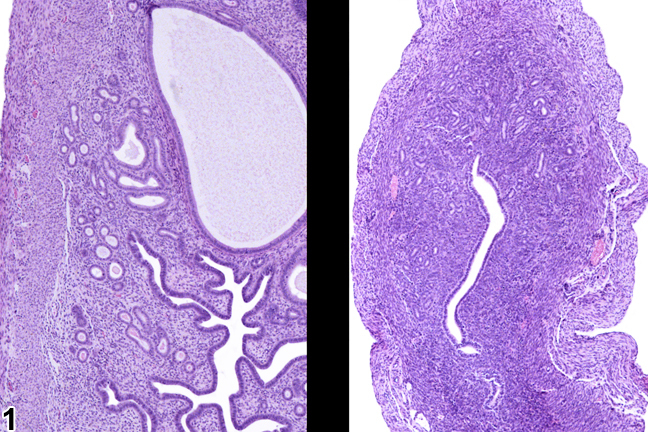 Endometrial glands are fewer than normal, the stroma may be collapsed or hyalinized (especially in aged rodents), and the myometrium is thin. Atrophy is also encountered in extremely malnourished animals. Atrophy can affect just one portion of the uterus, such as the endometrium or myometrium. Uterine atrophy must be differentiated from hypoplasia. Hypoplasia is a failure to develop and should very seldom be encountered spontaneously, the exceptions being reproductive and teratology studies. Uterine atrophy must be differentiated from immaturity, which can mimic atrophy; the other reproductive organs will also be immature. Treatment-induced atrophy usually occurs in several animals, and they can be compared directly with controls ( Figure 1 ). Uterine atrophy should be diagnosed and graded when it is treatment related or occurs in a short-term study. If only specific components of the uterus are affected, the specific structure(s) involved should be indicated in the diagnosis through the use of a site modifier (e.g., epithelium, endometrium, myometrium). Greaves P, Faccini JM. 1984. Female genital tract. In: Rat Histopathology: A Glossary for Use in Toxicity and Carcinogenicity Studies. Elsevier, Amsterdam, 171-179. Maekawa A, Maita K. 1996. Susceptibility of the female genital system to toxic substances. In: Pathobiology of the Aging Mouse (Mohr U, Dungworth DL, Capen CC, Carlton WW, Sundberg JP, Ward JM, eds). ILSI Press, Washington, DC, 481-493. National Toxicology Program. 1998. NTP TR-475. Toxicology and Carcinogenesis Studies of Tetrahydrofuran (CAS No. 109-99-9) in F344/N Rats and B6C3F1 Mice (Inhalation Studies). NTP, Research Triangle Park, NC. National Toxicology Program. 2000. NTP TR-491. Toxicology and Carcinogenesis Studies of Methyleugenol (CAS No. 93-15-2) in F344/N Rats and B6C3F1 Mice (Gavage Studies). NTP, Research Triangle Park, NC.